Boulder County has launched a new effort to address homelessness. Building upon the work of the 10 Year Plan to End Homelessness, Homeless Solutions for Boulder County is an innovative approach that includes multiple government entities (Boulder County and the Cities of Boulder and Longmont), the nonprofits working to impact homelessness, the faith community and those with lived experience. The work seeks to create a regional, integrated service system that combines a coordinated entry process with the provision of timely and appropriate supportive and housing services to assist people in moving out of homelessness and into housing in the most efficient ways possible. Beginning in October, 2017, a variety of changes were made to services for single homeless adults in Boulder County. The goal of these changes is to reduce the number of people in the county experiencing homelessness by providing more prevention-oriented services, and short- and long-term housing and services that will more quickly help people out of homelessness. These services will be available in the cities of Boulder and Longmont. People will access all city and county homeless services through the new Coordinated Entry system. 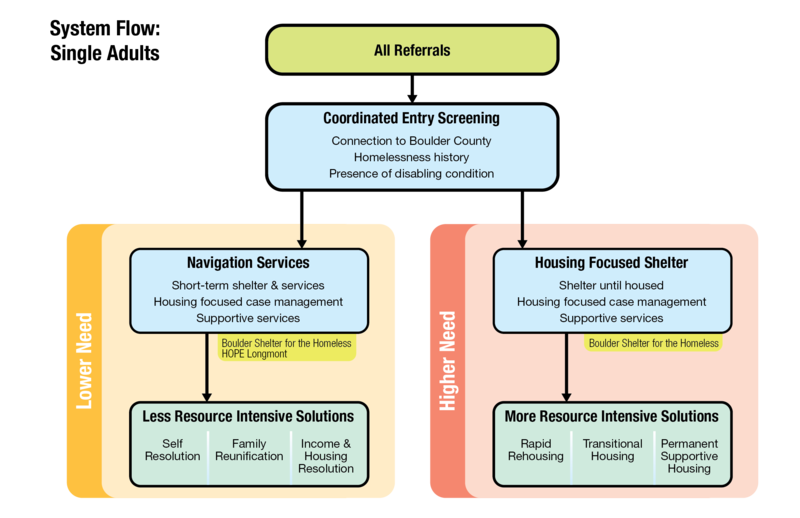 Clients will be assessed to determine if they are most appropriate for Housing-focused Shelter at Boulder Shelter for the Homeless (BSH), or Navigation Services. All single homeless adults must go through the Coordinated Entry process to receive services from Boulder County or the cities of Boulder or Longmont. After meeting with a staff person and going through a short screening, clients will be referred to the most appropriate service depending on their needs. Client screening services will be available in Boulder seven days a week at 2691 30th St, near the corner of 30th and Valmont. The hours are 10 a.m.-4 p.m. every day except Tuesday when the hours are noon-4 p.m. 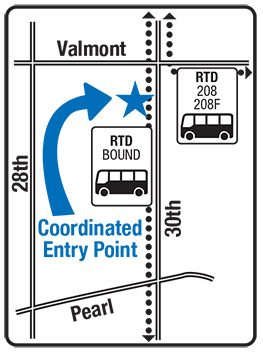 This location is accessible by the BOUND and 208/F bus routes. In Longmont, Coordinated Entry screening is available during the week at the OUR Center, 220 Collyer Street. The hours are 10 a.m.-4 p.m. on Monday, Wednesday, Thursday and Friday. The hours on Tuesday are noon-4 p.m. On weekends the hours are 11:30 a.m.-2:30 p.m. 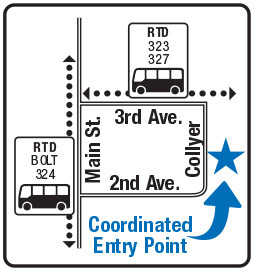 The OUR Center is accessible by the BOLT, 323, 324 and 327 bus routes. See options when Coordinated Entry is not available. Navigation Services provide short-term support for lower-needs individuals who require limited assistance to get back into permanent housing. Individuals will work with a case manager to develop a housing plan and can receive mediation support, financial assistance, legal assistance, assistance reunifying with support networks, and links to county and other community programs as needed. Overnight sleeping space will also be available to qualified navigation participants who need a place to stay in the short term. Boulder Navigation Services will begin as an extension of Bridge House’s existing Path to Home program, which uses faith community space for overnight sleeping, morning meal service, and case management. Clients will be referred to Navigation Services through the Coordinated Entry screening. In Longmont, Navigation Services are being coordinated by the OUR Center and HOPE. Housing-focused Shelter (HFS) will facilitate housing entry for qualified moderate and high-needs individuals by providing overnight sheltering and wrap-around services on an extended basis. Those participating in HFS can remain at BSH until they have been successfully, permanently housed. Contact: Jim Adams-Berger, 303-441-3839, for specific meeting information or questions. Please check the posted agenda for any meeting location changes.